Jeff Weed is one of the few people who can say he will ‘be there will bells on’ and not be speaking euphemistically. He will show up wearing not only bells but colourful ribbons and sashes, too. He will bring along a group of friends all similarly accessorized. And there will be music and dance. Weed is a member of the Toronto Morris Men, a group dedicated to perpetuating the centuries-old art of Morris dancing, and anyone who happens upon one of their performances is in for a treat. 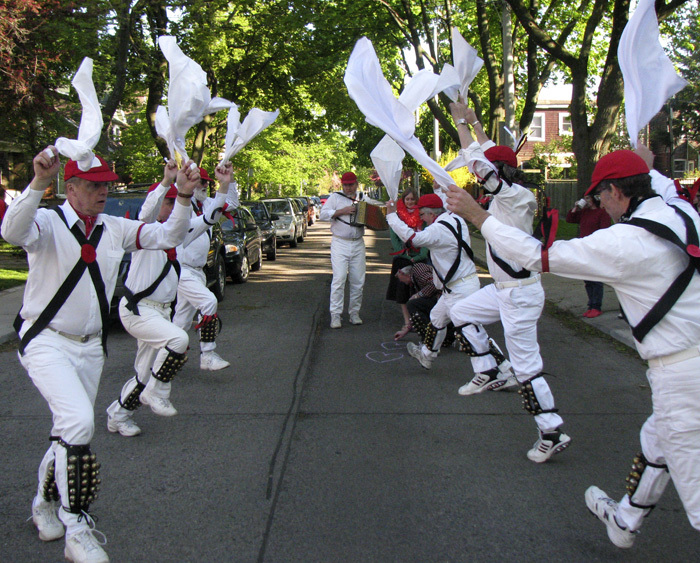 On May 1, they will gather in High Park at dawn to dance the sun up as the traditional start of the Morris season. Morris dancing dates from 15th-century England when rural villagers performed ritual dances to encourage crops to grow in the spring. Participants used bells and sticks as noisemakers to awaken the earth. Although similar rites were performed throughout England and Europe, Morris dancing is a particular version from the southern part of England, dating from about 1440. The Toronto Morris Men perform the Cotswold dance, originating in the southwestern part of England. Bells, sticks and even handkerchiefs are all part of their kit, or costume. “In that area it was very typical to use sticks, and at some point the handkerchiefs may have just been a replacement for the sticks,” Weed said. “Some dances actually use joined handkerchiefs. The handkerchiefs become extensions of the hands and can be waved in various ways. Again, very rhythmically and very unique, depending on which village the tradition comes from. Dancers traditionally wore white shirts and breeches, a knee-length pant that they would have been wearing while working in the fields. To distinguish one team from another, each village had its own group of coloured ribbons or sashes and no two teams are alike. Weed’s team colours are red, white and black. Weed, originally from Wales, was introduced to Morris dancing when he attended the University of Bath in England in 1972, and he’s been involved ever since. Part of the allure is the travel. His team tours regularly throughout Canada and the U.S., and a few years ago performed at Carnaval, celebrating the sugar harvest, in Santiago de Cuba. This summer the team will visit Iceland. The Toronto Morris Men love to put on scheduled and impromptu performances around the city. On Victoria Day (Monday, May 21) you will find them on Queen Street and along the boardwalk in the hours leading up to the fireworks display. On Labour Day weekend the team will meet up with dancers from around the world for an annual gathering in Queen’s Park and Dufferin Grove Park. They will also perform for weddings and special events, or you might just run into them on any given summer evening in the downtown core. The Toronto Morris Men welcome new members, and although this particular team is male only, there are also women’s teams and mixed teams. And be ready for a workout.